A year ago when I started the mini series "The Farmhouse" my reason for doing so was frustration over having such limited studio time. I found it hard to keep the momentum going on larger paintings that were in progress and they were going stale. I decided I needed to do something that I could complete with just the hour and a half or two hours that were available to me. In the beginning I did drawings but really wanted to paint. So I selected a scene that has been part of my daily life for over thirty years. This is not my house but the farmhouse and storage barn on the property where I keep my horse. This turned into a labor of love and I made the commitment to continue it throughout the year. That year comes to an end tomorrow. I had a new painting, a relaxing experience and a sense of accomplishment. A complete mood change! This will most likely be the last painting of the series. I must find another subject to replace it this year. I have been mentioning the Black and White Exhibit at the Salmagundi Club and have been providing the link www.salmagundi.org so that you can see the show online, however, the images have not yet been posted. You can read the history of the show and see photos of the intensive renovation that has been holding up the works. 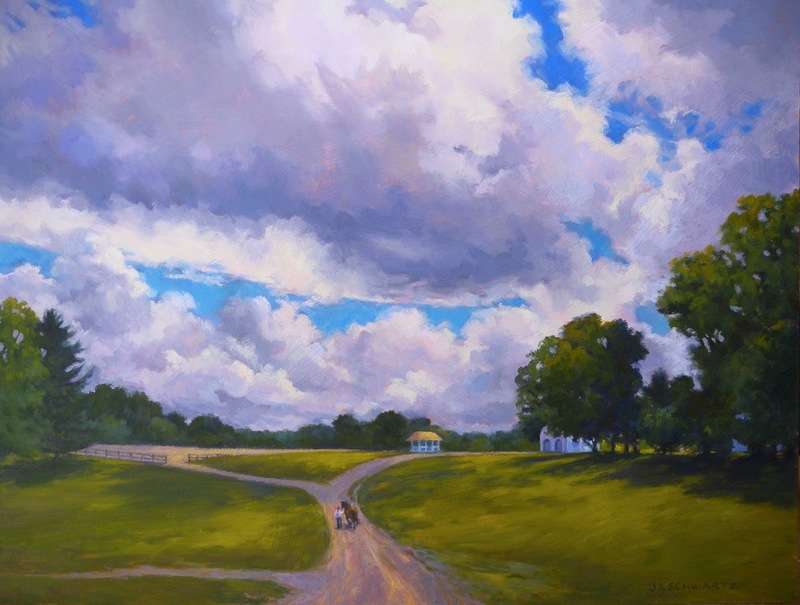 This is the Salmagundi Club's most historic show and is usually held in the main gallery but due to the renovation it is being held in the smaller Lower Gallery this year. no other color but I can envision some future cityscapes that will be black and white with subtle additions of color. I like the looseness of these paintings and I found that it was easy to work quickly while just making value decisions. By contrast the Pennsylvania Avenue painting below demands more decision making. I still don't have a title. I also don't have a decent photo for you. This was taken with my iPad camera as the light was fading. I continued working a little longer under studio lights and then sat back to assess the progress. I hate this stage when I am just getting paint on the panel but I am far enough along to recognize adjustments I need to make. For instance, after taking this photo I scraped off the blue cafe umbrellas in the foreground because I realized they were too high. Overall I feel I am off to a good start with this one and will post more about my inspiration for it and what I am using for reference in the studio. Tomorrow should be another sunny day so maybe I will have a better photo when I do my next post. BRRR! Another day in the deep freeze! I was in and out most of the day and spent a good amount of time at the barn making sure my horse Gypsy was well exercised. She is 20 and making sure she stays warm and limber is important on these frigid days. I came home and got to work for a couple of hours in my wonderfully warm studio which is much appreciated on days like this. 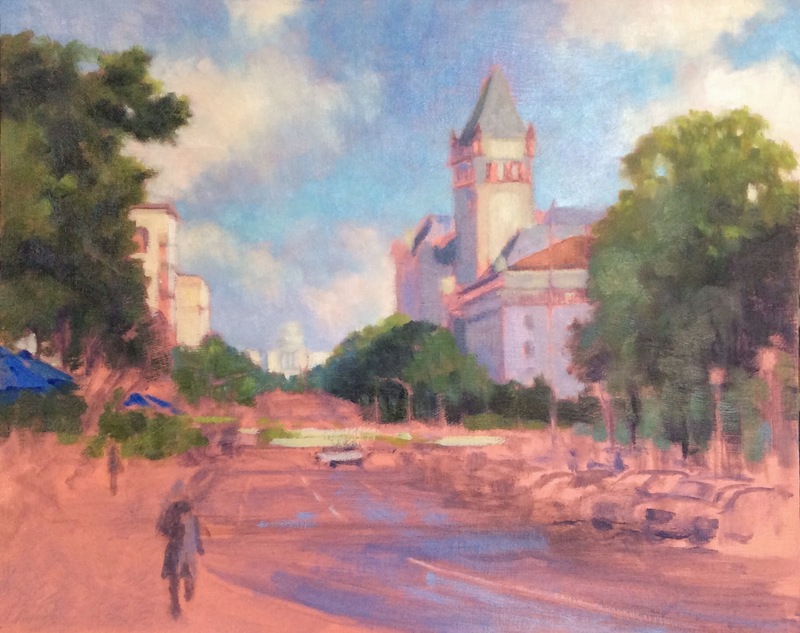 As you can see I have begun to add color to the new Pennsylvania Avenue painting and will continue working all around the painting before refining the image and adding heavier applications of paint. The painting is still quite rough and I look forward to the refinement stage. Also rough is this photo. It is straight out of the camera and I have uploaded it to my iPad so I can sit before the fire and create this post. It is not a very good image, the sky is much brighter than it appears here but at least you can see how the painting is developing. 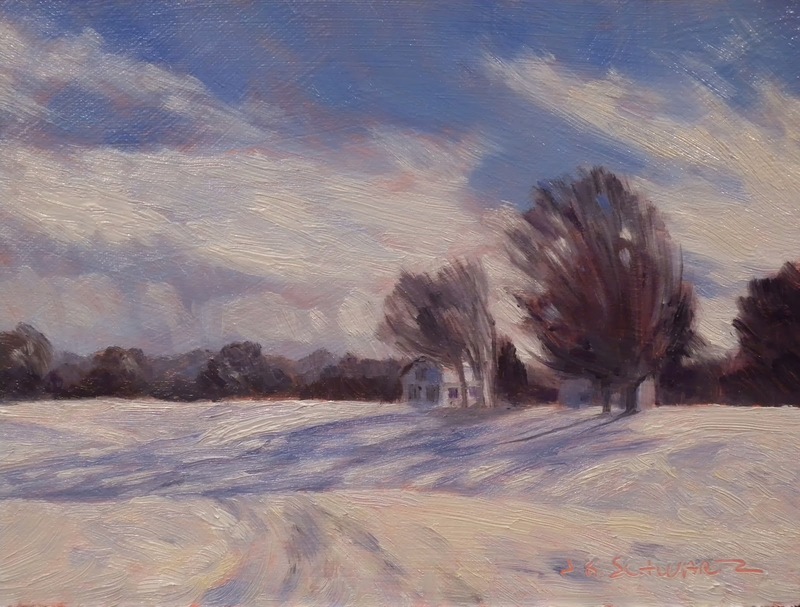 In a couple of days my year long mini series "The Farmhouse" will come to an end and it looks like the final paintings will be snow paintings. When I get them all uploaded to my website I will let you know. Now I want to find another subject for a mini series. I do have the Surf series but I only work on that when I am at the Outer Banks. By the way, it would be great fun to be there now as they are expecting 10 to 12 inches of snow! 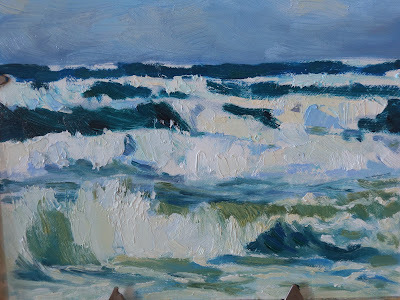 I would love to paint snow covered dunes and beach with a pounding surf. 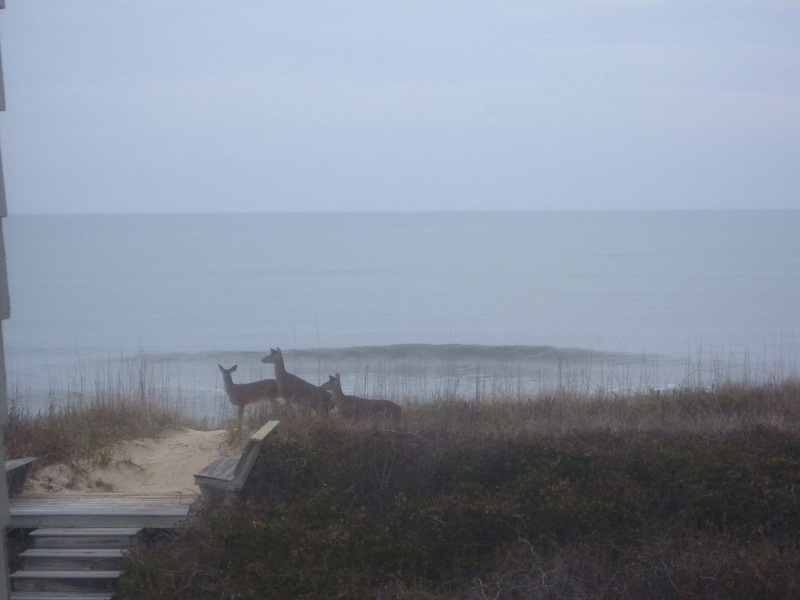 That is a sight seldom seen in North Carolina! This painting from July almost made it to the "lows" side of the ledger yesterday. I did a really stupid thing! I placed it on my large easel and then placed my new painting "Sun Break" on the brush tray in front of it. The object was to see how they looked together as I am thinking of entering them in an upcoming juried show. I left them there so I could consider them for awhile while preparing a panel on the work station in front of the easel. Before I started to gesso the panel with a peach toned gesso I turned "Sun Break" around to protect it from any potential splatter. I didn't feel the need to move the larger painting as I figured it was out of range. Bad assumption! I have no idea how I managed it but when I was finished with the gesso I looked up and the back of "Sun Break" was splattered all over. My eyes moved upward and sure enough there were peach toned splatters all across the painting and the espresso colored frame! 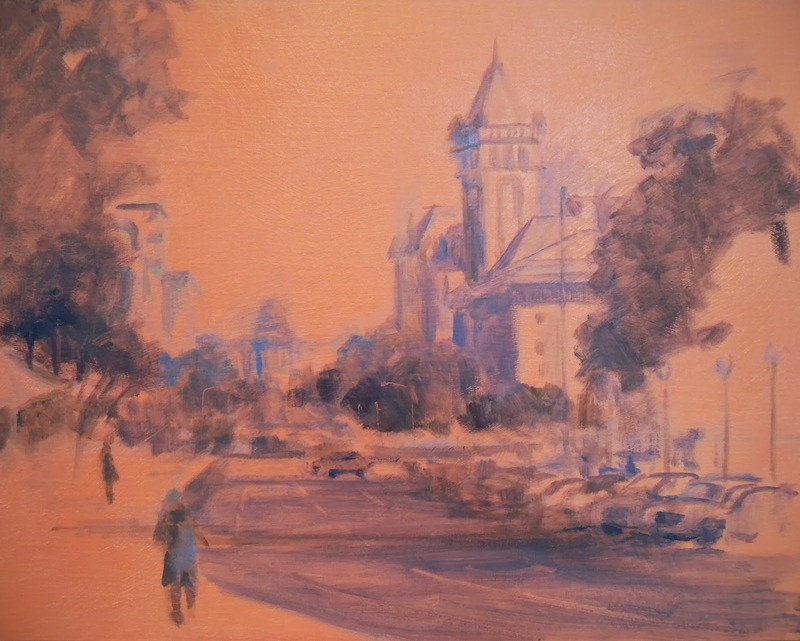 Today I set the panel I gessoed yesterday on the easel and began work on a cityscape. 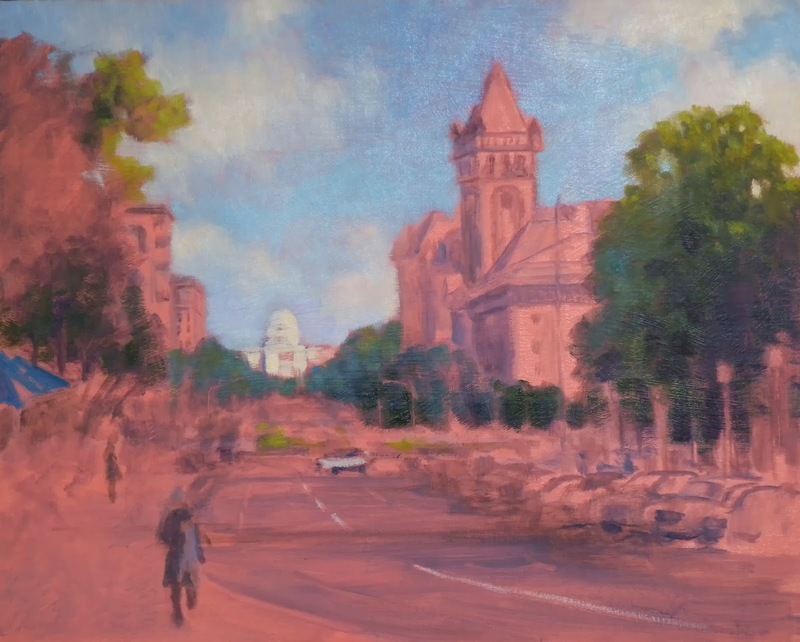 I don't have a title for it yet but it is another Pennsylvania Avenue painting. The view is from the front of the Willard Hotel looking down the Avenue towards the Capitol. The large building on the right is the Old Post Office Building. Here is the rough in and I will post the progress on this one. 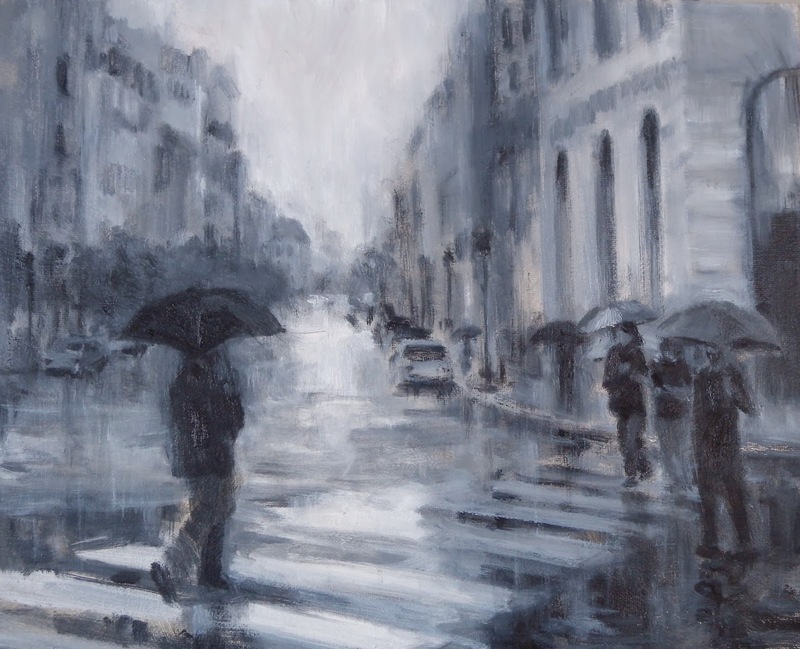 Tomorrow the Black and White Exhibit opens at The Salmagundi Club! Finished! Okay, I have spotted three teensy things I want to adjust (tweak in painter speak) but otherwise this painting is finished. As I anticipated this was a three session painting. After making the minor changes I will banish this from the studio so I won't be tempted to play around with it. The painting works just fine as it is. One of the minor changes I will make is in the shadow cast by the fence posts on the left of the painting. The angle is out of sync with the other shadows. The title came to me as I was mixing the yellow for the highlights in the snow. I don't even know if that is a word or if it should be two words. Regardless, it is the moment the painting is about. If the weather forcast for the upcoming week is correct there should be another opportunity to paint snow! Today was a busy day of packing and shipping my three paintings for the Salmagundi Club. I will let you know as soon as those exhibits are posted online so you can see those shows. Of course if you are in New York you can see them first hand. This afternoon was sunny so I put in a couple of more hours on this new painting from my last post. The title is a tentative one as I believe I have used it before. It is almost done and I am sure it will be the next time I work on it. I would like that to be tomorrow but I will be involved in meetings most of the day and I don't know if there will be enough light by the time I get home. Frustrating! Titanium white takes a long time to dry and as I used plenty of it in this painting I can probably skip a day and still be able to work wet into wet. I am happy with this one so far but I wish I could come up with a better title. 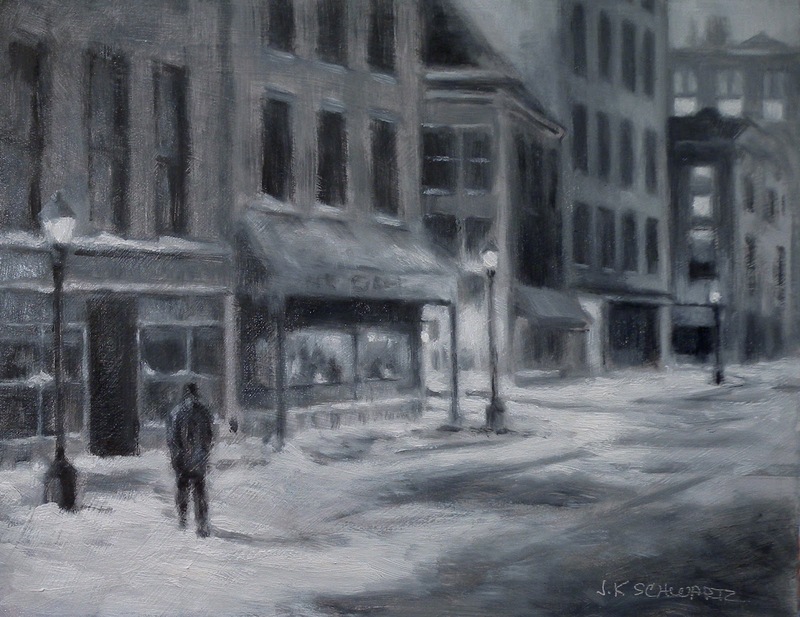 I received good news from the Salmagundi Club in NY today informing me that both of my paintings were selected for the upcoming Black and White Exhibit. It will be the 136th! Quite a long running tradition and I am happy to be participating in it. Scroll back to my December posts to see "Rain In The City" and "24 Hour Cafe" which are the two paintings that will be in the show. They also told me that the painting I submitted for the Members Annual Exhibit was accepted as well. That will be a big show and will be the first in the newly renovated upper gallery. It will be a grand reopening and I do hope I am able to travel up for it. That show will be in February but as finishing touches are still being worked on in the gallery the opening date has not yet been set. In any case all three paintings have to be there by the 24th of January so I have some packing and shipping to do! I mentioned a couple of posts back that I was eager to start work on this studio painting. 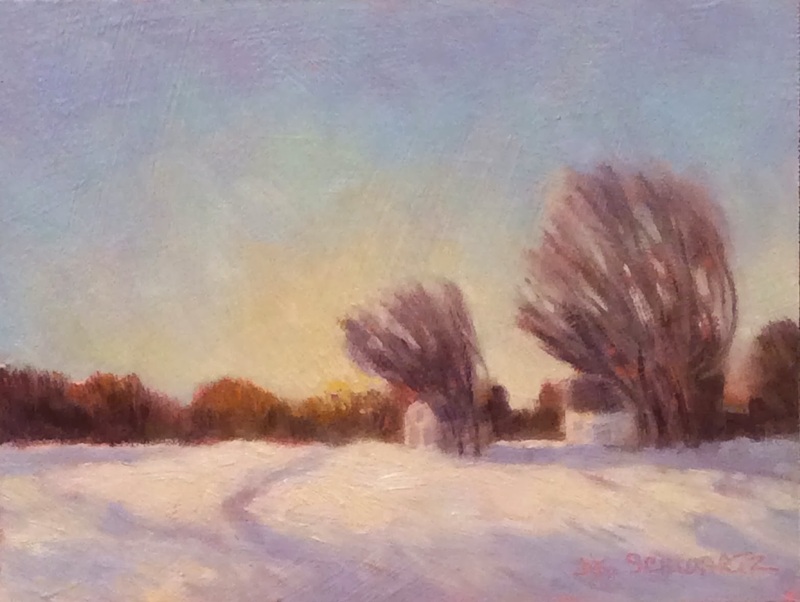 The inspiration and study for it is "Sunlit Snow", the little 6x8 painting from the post before last. Instead of looking at the farmhouse this view pans to the left of it. The storage barn on the far right is the one you are used to seeing in "The Farmhouse" series. I find the 6x8 inch format too small to also include the gazebo that you will see develop here. I had wanted to start the painting over the last weekend but we had dark, gray, rainy weather both days so I contented myself with prep work. This painting needs to be painted in the bright winter sunlight that I enjoy in my studio. Today fit the bill. I didn't take the time to photograph this in stages so the image above is where I stopped work for the day. I used the same peachy pink under painting as in the small study and took a standard approach of sketching in the scene with a brush and then establishing the lights and darks. I used a mix of ultramarine blue and red oxide for that. 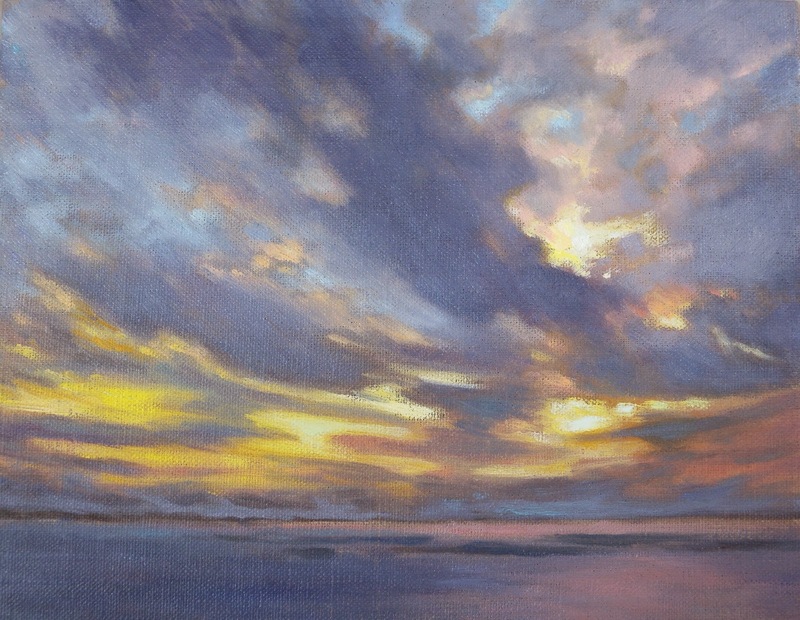 The next step was the sky and deciding where the brightest areas of the painting would be. I used # 12 and # 10 bristle brushes to start. When I resume work I will be using slightly smaller brushes. I had a lot of colors on my palette. 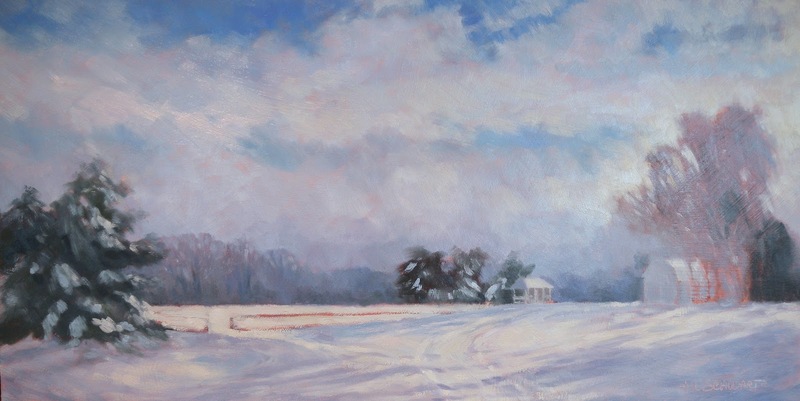 When painting snow or anything white I use yellows, pinks, lavenders and blues with just a few strokes of pure titanium white here and there. At the end this will look like a blue and white painting just as the snowy day looked like a blue and white day. Painting white in sunlight and shadow is fun and interesting. You can't achieve the brilliance of snow by representing it with just white paint mixed with black for the shadowed parts. I know some of my readers are just beginning to paint and painting white objects by using color as I have described above is a good exercise. I will not be working on this painting long so I have already begun drawing my next one. It will be another cityscape "Leaving Philly" and I will show you a sketch in my next post. A Day Full of Art, an Artful Day? Today my husband and I went to see the Van Gogh "Repetitions" exhibit at the Phillips Collection here in DC. It was an interesting show and an opportunity to see some of his paintings that I have never seen before. I also purchased a lovely little book, " Van Gogh's Gardens" which is proving to be an interesting read. I like the concept of repeating images and I have discussed that here before with my mini series "The Farmhouse" and "Surf". Van Gogh's reasons may have been different from mine, more about making improvements and varying the palette but it was interesting to see the same scene or person in multiple paintings. Afterward we headed to American Paintings Gallery where I exhibit my work and dropped off the painting I have uploaded above. This is the large, studio version of a scene I have done several little paintings of. 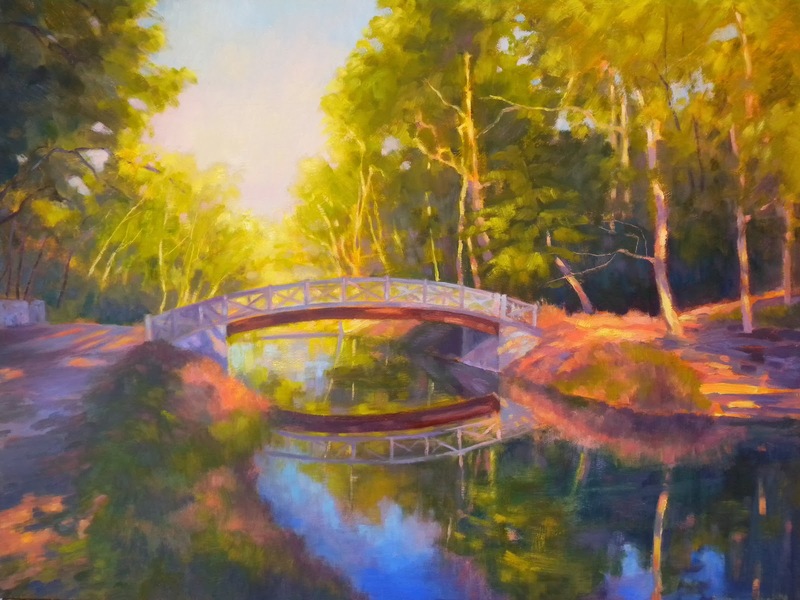 This one, "Old Angler's Bridge", is late summer and it depicts a day that is the polar opposite of what we experienced here on this cold, rainy, gray January day. The painting will be on exhibit for the next couple of months. If you are in the neighborhood the gallery is located at 5118 MacArthur Blvd.,NW, Washington DC. 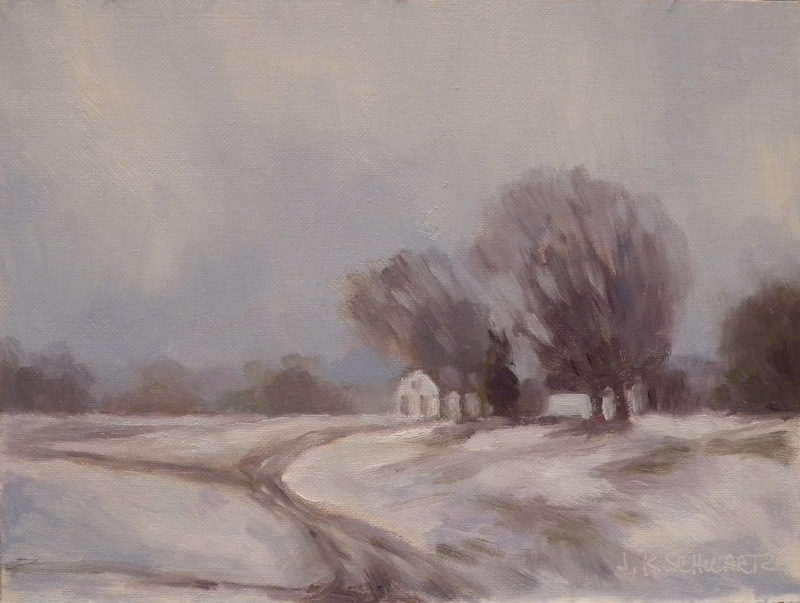 On January 5th I mentioned I had painted a new addition to "The Farmhouse" and I hadn't photographed it yet. I got around to it today and it is an appropriate image for today's post since the weather was much the same as I have described above. It is amazing how grateful we feel to be out of single digit and sub single digit temperatures and back to plain old below freezing :-) Those of you in more northern latitudes must think we are pretty wimpy. It is just that we are not accustomed to it and it requires some adjusting of habits. I spend part of everyday out at the barn with my horse and have continued to do so in spite of the cold. I have been calling it "defrosting my horse". Actually Gypsy has been quite comfortable. She has a full winter coat, a warm blanket to wear and a cozy stall out of the wind. She has her exercise in the large indoor arena which is a blessing because the ground is frozen like concrete. So, on such a day I am pleased to come home early have a cup of tea and get to work in the studio! I like the pace I am going at right now. I can be more consistent and less frenetic. I hope I can keep that up! 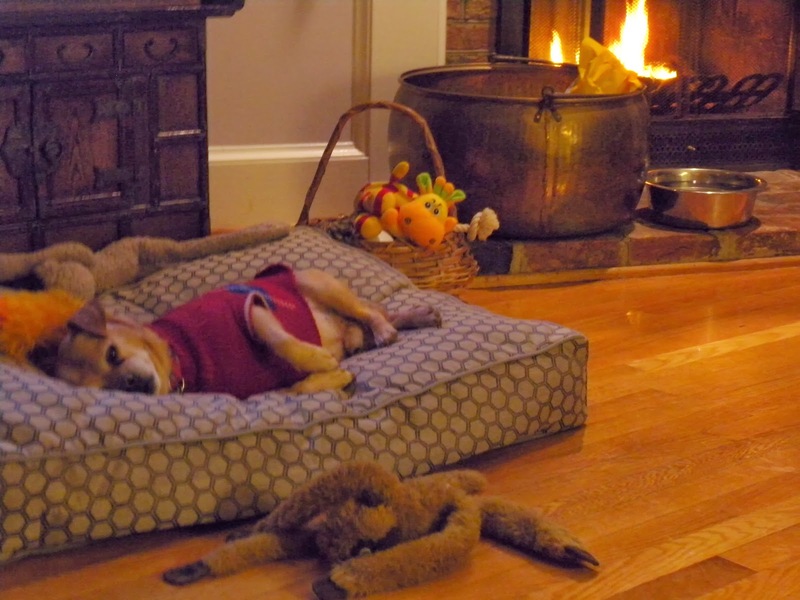 I will leave you with a cozy image of one of my dogs dealing with the cold day. He had the right idea! We left the Outer Banks early yesterday morning and it was really hard to leave particularly due to the clear, strong light on the crashing surf at high tide. I should have been painting it, not leaving it. We had an easy drive home which was fortunate because what awaited us back in Virginia was a beautiful afternoon of sunlight shimmering on snow. Hence the inspiration for the painting above. 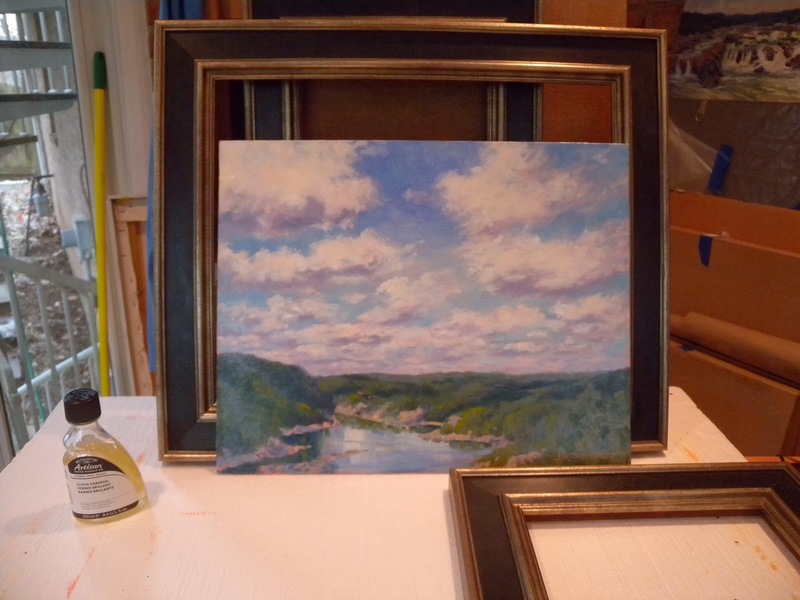 Besides adding to my mini series (that will draw to a close at the end of this month) this is a good study for a 12x24 inch painting that I will start in the next day or two which will be an extension of this view. I will post images of that in progress unless I do it all in one session. I am really looking forward to it! I will leave you with this watercolor study of surf that I painted from the window on Friday. I continue to enjoy finding my way with this medium and love the transparency. 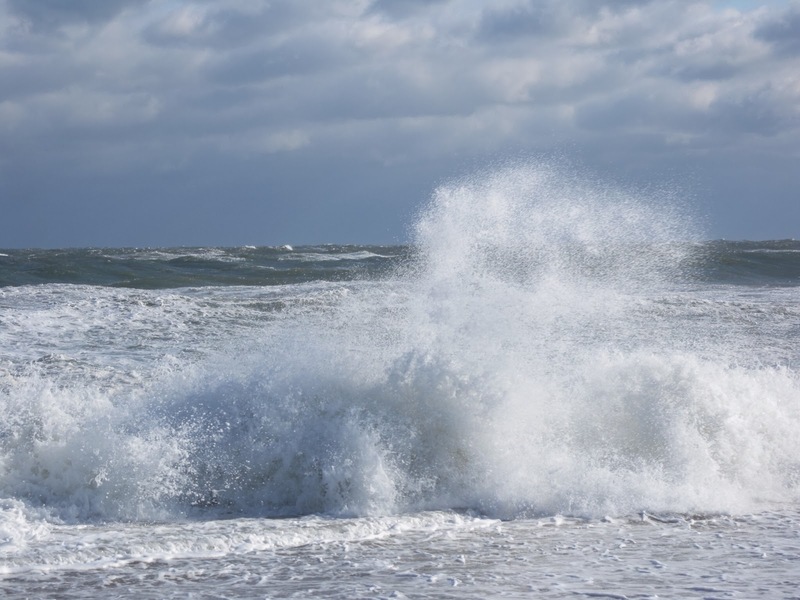 This morning we woke up to the sound of pounding surf. Looking out the window we could see there was plenty of the white stuff but happily it was not snow! 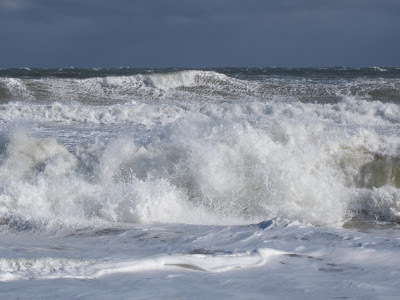 Foamy white surf was airborn by 40 mile an hour winds. I bundled up and headed down to the beach where I was given quite a sandblasting but lasted long enough to get some good photos. Clearly, I would be painting from a window today. Winter storm Hercules came in hard and fast. I know we have snow waiting for us back in Virginia tomorrow so we will have some shoveling to do after all. Here is the completed painting from yesterday. I finished it this morning. 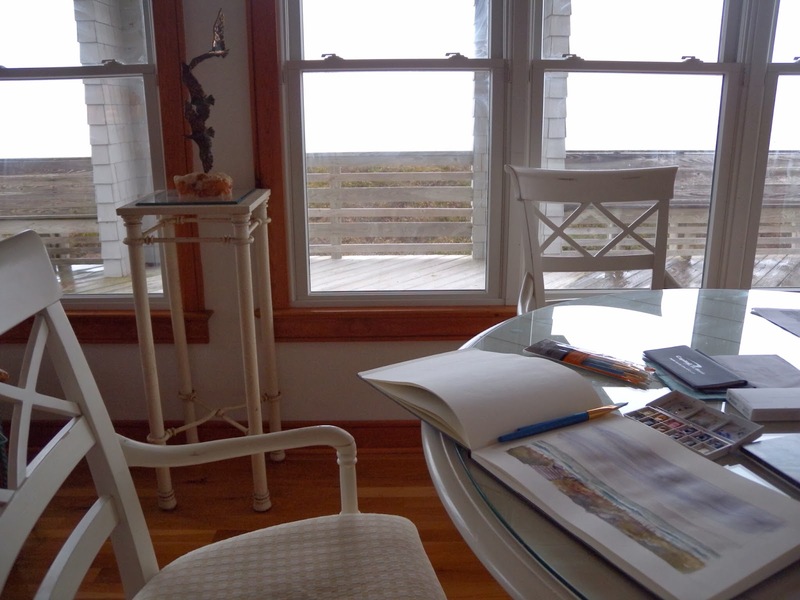 This is not turning out to be the plein air vacation I had hoped it would be as there have only been brief periods of sun. The light has been flat and gray most of the time and while soft days like that can be beautiful to paint I have felt uninspired to get out and do so. The cold I am suffering has contributed to that reticence. Instead I have been working from the windows. I took out my mini watercolor set today and just sketched. Ugh! Here in North Carolina it will be a rain event with some flurries but back in Virginia snow is expected. We have decided to wait an extra day before heading home. I have no problem with that at all. On the rare occasions it snows here on the Outer Banks it can be quite beautiful. That would be worth painting. I may paint it whether it occurs or not. 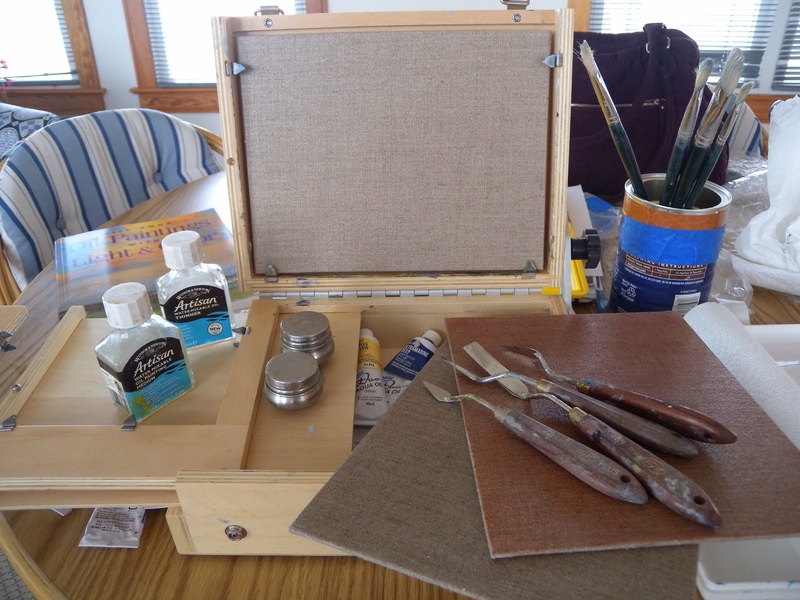 I have a half box French easel that I keep here at the beach but since I had intended to be out with my pochade box I only brought 6x8 and 8x10 inch panels with me. 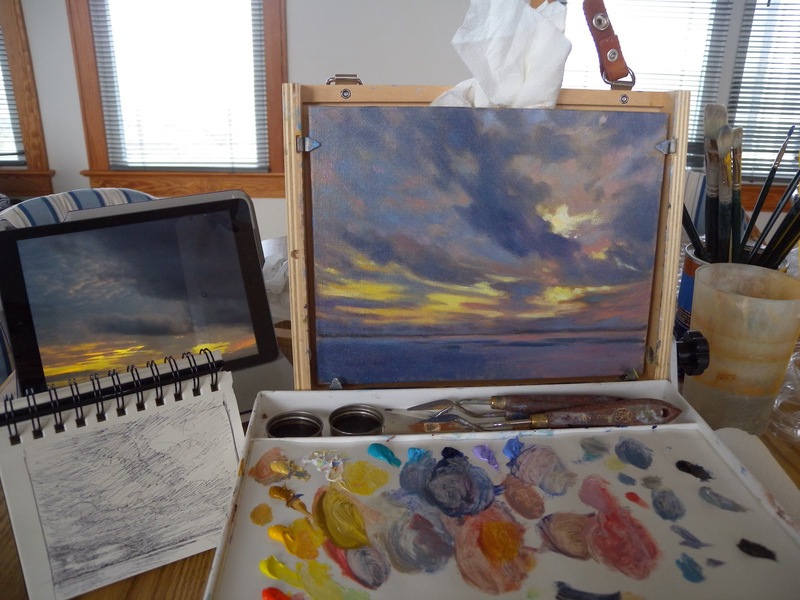 It was easier to just set the pochade box on a table and use my palette box instead of the smaller one that comes with it. I worked for an hour and a half and stopped when I reached the point you see in the photo above as the skies had become heavy and gray. I needed to turn on some lights and that was going to change the colors. Better to get back into it tomorrow. I want to thicken up the paint a bit as the surface is uninteresting to me as it is. I thought you might like to see some of the materials I work with. 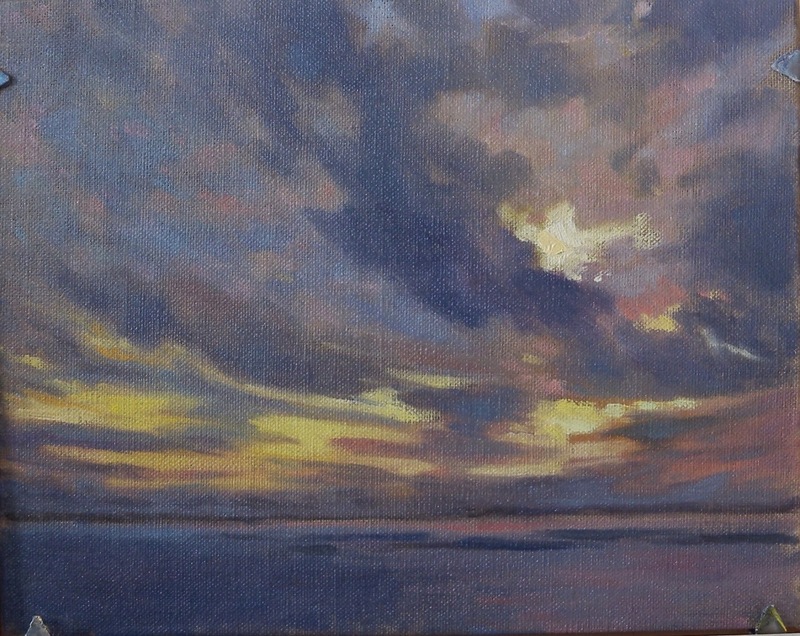 I use water mixable oils rather than traditional oils as they are versatile and free me from solvents. It took me a while to find what works for me as there are vast differences in the various brands. I think the very best is Holbein Aqua Duo. The paints are vibrant, well mixed ( none of the separation that I found with some brands) and they pull like traditional oils. Drying time is almost the same, just slightly faster. If you use water as your medium, which I never do, they will dry more quickly. I only use water to clean my brushes. Cleanup is a breeze with water and Master's brush cleaner. I prefer hog bristle brushes and they have much longer lives with these paints and that cleaner/ conditioner. My mediums are Winsor Newton Artisan thinner and painting medium. I use them just as you would use traditional mediums. The more medium the more shine. You can get some beautiful glazes with the painting medium. If you use water as your medium you will find that the paint dries quite flat and you will have to work before it sets up because it can get gummy. People who complain that these paints feel gooey are most likely using water as the medium. In the photo are clear primed linen panels two of which (those lying down) I have toned and have applied another layer of clear primer to. These take the paint beautifully. Sadly, they are being discontinued and these are all I have.